The weather today is cold and wet, so I decided to break out the macro lens and take a few pictures today. First off, here's the new frag I picked up a few days ago, a Montipora digitata. I decided to part it in a section of dead skeleton for now where I knew nothing would touch it. I may have to move it so the Sebae doesn't tentacle it to death, but for now it looks great. Dory has found a new spot to sleep. It's rather cute. In the very bottom of the tank in the front, there's a montipora capricornis. About 10 days ago, I saw her from across the room swim deep into the coral, then back out with something in her mouth. I'd hope to film her actions, but she spotted me and played fish instead. lol Anyway, turns out she was cleaning out whatever bothered her, and now goes into that spot to sleep at night. The melanurus wrasse is usually out and about, but I'd noticed over the past few weeks it was looking thinner and thinner. I'd watch closely when I dumped in my "dumptruck of food" as my buddy Evan used to say, and the fish would eat some food, but would also miss portions as if his aim was off. That was my reason for thinking he was dropping weight, he just didn't have the visual acuity he used to have. I've had this fish since 2011, for seven years. I'm not sure what their lifespan is. Who let out all the helium? I've had the Sebae anemone for over three years, but tonight it decided to do something I've never seen previously. I mean, if water quality goes to crap, anemones may respond accordingly. Or during a full moon, they may choose to spawn into the reef. But when everything is just like it should be, a mundane day at that, seeing it go from Super Saiyin to something a tenth of its size is noteworthy. Read more about Who let out all the helium? Did you know that if you get a harem of female Lyretail anthias, you'll end up with one or more males at some point? Lyretails are beautiful bright orange fish with a purple eyeliner like Cleopatra, when female. When one decides to change to male, the fish will turn bright purple, extending a spike on their dorsal fin and will express dominance over the females. This pictures today were unintentional, the fish swam into my field of view so I snapped a couple to share. First, here's an example of a female. How do Hippo tangs get to us? I found this video to be quite interesting. It's 33 minutes long, showcasing how fish are captured in Indonesia, how they are quarantined, measured, and prepared for travel. One moment that caught my eye was how they added air to the bags initially using a hose from an inflated inner tube. The fisherman are creative, and of course want their efforts to result in success rather than death. Overall, this video gives hobbyists a realistic overview of how fish come from there to our homes. Hopefully you have the time to watch the entire thing. Read more about How do Hippo tangs get to us? Most of the time, the skunk clownfish remain in the tentacles of the Sebae anemone. Some have migrated to some nearby Duncans and are seen swimming through the green hammers, but the Sebae is their home. When I feed, the harem tends to swim out into the open to get their share. But today I saw something different: They were swimming upwards into the open water column in a group, which was rather appealing to observe. I tried to get a few pictures. These will will have to suffice. Last Saturday, the DFWMAS Frag Swap took place. I spent a few hours there selling various products from Melev's Reef since I'm a club sponsor. And to my left was another club member, who had this adorable puffer for sale. All day long, everyone gazed into the bucket and stared into its irridecent eyes, but when the event concluded, this Porcupine Puffer came home with me. While I was talking to a friend on the phone today, I was gazing at my aquarium and when I spotted this surprising activity, I had to quickly change topics to share my excitement. The Anemone Cube has been running for 3.5 years, and it was my hope that my clownfish would start laying eggs. However, after a while one perished and I was left with only one, a bright orange ocellaris. It grew larger but was lonely. About 18 months ago, I added 16 more clownfish from a local breeder, so that family of tiny clowns were hopefully going to be accepted by 'her' and all would be well. 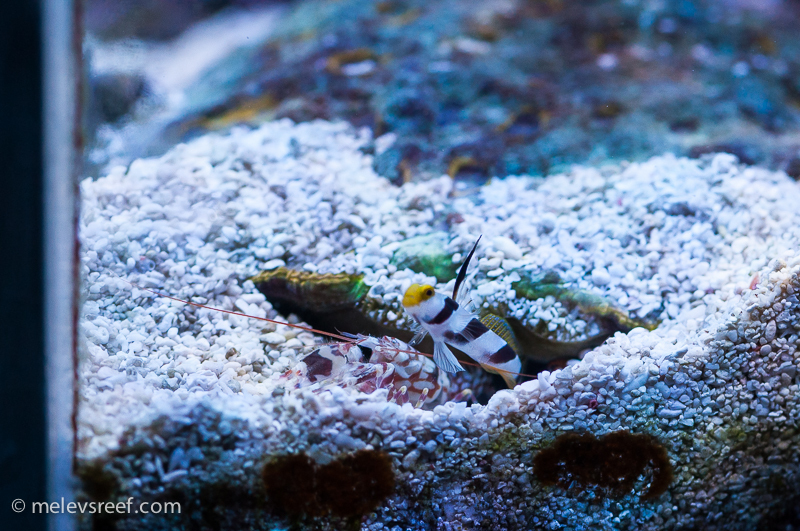 The shrimp is nearly blind, so the goby plays lookout. His tailfin touches the shrimp at all time, and with a single flick the shrimp retreats instantly, the fish quick to join in. It's a symbiotic relationship. This is a Hi Fin Red Banded Goby. Posted 13 hours 1 min ago.